Wow, that was a thrilling and creepy journey through the post-apocalypse tunnels of Moscows subway! I never imagined Metro 2033 to be so creepy in the first place. You can actually feel the tension when the Protagonist Artjom passes through dark tunnels with his flashlight as the only lightsource, not knowing if something is sneaking up behind him (or what it is, that is sneaking up to him..). When I was reading in my living room and some of my neighbourgs cats started fighting right outside my window, the sudden noise literally made me jump.. (and so did my cat, who was sleeping right next to me, but due to different reasons). 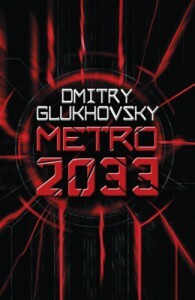 But even if you don't like dark tunnels, tight rooms, post-apocalyptic settings, ongoing tension and things jumping at you out of the dark, Metro 2033 is still worth reading, because it lets you appreciate the marvellous world we live in - you know, where you can simply take the subway to move through town, where don't have to be afraid of librarians trying to kill you and where we have enough energy to turn on the lights when the dark scares us for some reason. So, suit up, put on your best radiation protection suit and join Artjom on his awesome journey through Moscows underground system to accompany him in his struggle to find out the answer to the most important question: what is going on here?